omitting additional fat. Drain pasta in a colander over a bowl and reserve the cooking liquid. 2. In a saute pan, heat 1 tbsp. of olive oil. Add shallots and garlic and sliced mushrooms. Saute until tender. 3. Add chopped spinach and allow it to wilt. Turn off the heat. 4. Combine 1/2 cup reserved hot cooking liquid and ricotta cheese in a food processor or blender, and process until well blended. 5. 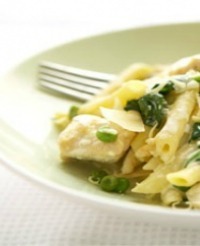 Combine hot pasta, cheese mixture, spinach mixture, and remaining ingredients in a large bowl; toss gently to coat. Add additional cooking liquid to moisten, if needed.